Earlier this week, Bahrain’s highest court and final judicial authority upheld a series of ferocious sentences passed upon 13 nonviolent democracy activists, seven of them to life terms. In so doing it seemed to foreclose any possibility that the entrenched minority regime of the country’s Al Khalifa royal family might yet honor the pleas of human rights organizations and political leaders from throughout the world (ranging from U.N. Secretary General Ban Ki Moon and his high commissioner for human rights through virtually all European foreign ministers, and even significant voices in the Obama administration). It further flouted the explicit findings and recommendations of the international commission (headed by the renowned jurist Sharif Basyouni,) which it itself had empanelled less than two years ago, in a farcically short-lived feint at reconciliation. Among those whose life sentence was upheld was the 52-year-old Abdulhadi al-Khawaja, whose 110-day hunger strike earlier this year momentarily drew world attention to the country’s ongoing travails. At the time he suspended that hunger strike, regime spokesmen lavished international reporters with assurances that his situation and that of his prisoner colleagues would be receiving full judicial review — the very review that has now come to naught, exactly as both he and numerous family members at the time predicted would prove to be the case. In the entire Arab Spring, Bahrain’s so-called Pearl Revolution, its violent suppression by the extremely repressive and deeply entrenched elements of the country’s Khalifa hereditary monarchy and the ongoing struggle of the vast majority of Bahraini subjects against that repression has stood out as one of the most enthralling sagas. And the exemplary role not only of Al-Khawaja but of his entire family (notably including his wife and two daughters) has drawn increasing attention. Indeed, with the season for nominations fast drawing to a close (this Feb. 1), there has been a small boomlet of speculation suggesting that the Al-Khawajas might well prove worthy of becoming the first family as such ever to be awarded the Nobel Peace Prize (a selection that, for that matter, would be the first to honor the current Arab Spring as such). Following primary and secondary education in Bahrain, Abdulhadi (born in 1961) traveled to the U.K. to continue his studies, becoming engaged in the pro-democracy activities of Bahraini students abroad. When fellow students, returning to Bahrain, began being systematically detained and tortured and his own family home was searched and ransacked, Abdulhadi resolved to continue his activism from exile, being granted political asylum in Denmark in 1991 and helping to found the Bahrain Human Rights Organization there the following year. Between 1992 and 2001 the organization gained respect for persistent, professional and nonpartisan activities at an international level, which contributed to the political changes that took place in Bahrain when a new ruler came to power in 1999. 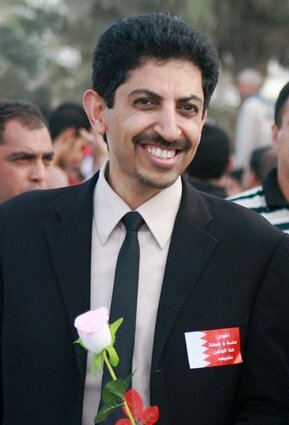 Following a general amnesty, Al-Khawaja returned to Bahrain in 2001, where he helped found and became director of the Bahrain Center for Human Rights (BCHR) and the Bahrain Unemployment Committee. Alas, Bahrain’s liberalization proved short-lived (in part due to considerable push-back from more hard-line elements of the regime), and by September 2004 the BCHR had been shut down and Al Khawaja arrested. Following two months in prison he received a one-year sentence, subsequently suspended. On July 15, 2005, the government’s crackdown on a peaceful demonstration sent 32 participants to the hospital, including Al-Khawaja, who subsequently displayed evidence of the savagery of his beating. In the years thereafter, Al-Khawaja was regularly subjected to further arrests, physical harassment and smear campaigns (though vociferous local and international support generally led to his early release). In the wake of the Arab Spring in early 2011, the regime’s on-again/off-again tolerance for Al-Khawaja’s increasingly effective activism came to a complete end. Following the March 14 suppression of the short-lived Pearl Revolution in the Bahraini capital of Manama, police broke into al-Khawaja’s home on the night of April 9, administering his most savage beating yet (breaking his jaw, dragging him downstairs by the neck, leaving a trail of blood, before spiriting him away, unconscious, to a prison hospital, where he required four hours of surgery for head injuries). On June 22, 2011, al-Khawaja and eight other human rights activists were given life sentences (in response to which, al-Khawaja raised his fist and shouted “We shall continue on the path of peaceful resistance!” as he was bustled out of the courtroom). In the wake of the regime’s failure to honor the recommendations of its own Basyouni Commission report — which found charges of torture justified and the preponderance of legal persecutions (including al-Khawaja’s) illegitimate — on Feb. 8, 2012, al-Abdulhadi launched his open-ended hunger strike, protesting his own continuing detention and that of his colleagues, under the slogan “Freedom or Death.” And indeed, he almost did die: on May 29, following 110 days (during which the regime repeatedly subjected him to sessions of force-feeding), and following the demanded release of one fellow activist, al-Khawaja finally did suspend his own action. But his incarceration, and his active resistance by various other means, continues to this day. With Abdulhadi in prison — and currently on hunger strike — the torch of his struggle passed to the rest of his family: his wife, two sons-in-law and especially, and most impressively, two of his daughters (both of whom had already been deeply engaged in human rights activism, even before the Pearl Revolution): 29-year-old Zainab (in country) and 25-year-old Maryam (abroad). Zainab (born in 1983), herself the mother of a toddler daughter, has engaged in countless actions over the past several years, sometimes entirely alone, as in April 2012 when she repeatedly sought to draw attention to the condition of her hunger-striking father (as in the photo above, at left, and also in this haunting clip of video in which she can be heard from a passing car, plaintively calling out to her father from outside the prison walls – an action that resulted in a four-day imprisonment); other times at the lead of mass demonstrations (as on Nov. 26, 2011, when she wedged her lone body between heavily armed police phalanxes and surging crowds, daring authorities to fire on her rather than them, hoping against hope that her relative notoriety would serve to shield her: see footage of the event and this interview posted on the New York Times blog for Zainab’s account of the standoff). 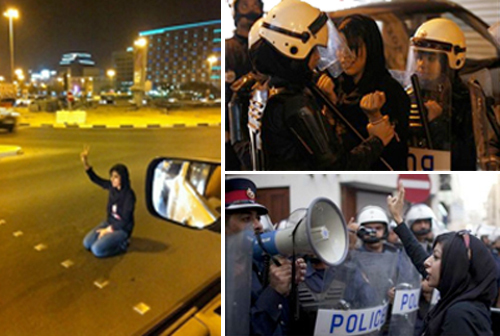 Zainab al-Khawaja, in front of Bahraini riot police. 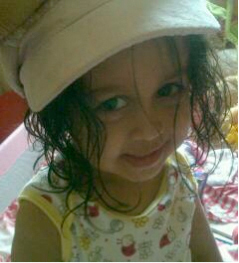 By the end of 2012, she had been arrested seven times and spent a total of several months in prison. Undaunted, after each release she has resumed the struggle. 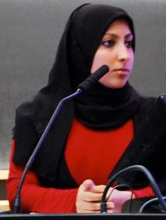 Maryam (born in 1987), meanwhile, soldiers on from abroad, in her role as deputy director of the Bahrain Center for Human Rights (and acting director whenever its Manama-based director is under arrest, which is much of the time), traveling the world from her home base in Denmark, addressing parliamentary bodies, international commissions, and various human rights conclaves, seeking out reporters and tirelessly calling attention to the fate of the pro-democracy struggles across the Gulf region, especially in her Bahraini homeland, and with particular urgency, of course, highlighting the plight of her imprisoned father. On one especially moving occasion, on April 25, 2012, a half-hour before she was slated to address a commission of the European Parliament, she received word that her hunger-striking father had the previous day disappeared from his hospital bed, no one knew to where though there were terrible suspicions that he might have died during the night; notwithstanding which, entirely composed, she proceeded to deliver a thoroughly trenchant account of her country’s situation in the broader context of the Arab Spring (see video here). 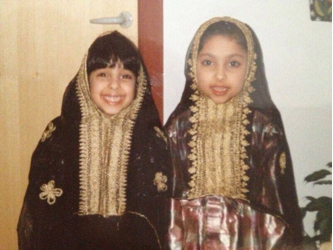 The sheer poise and dynamism of the two Al-Khawaja daughters obviously owes something to the life example of their imprisoned father, but this is hardly to minimize the contribution of their mother, Khadija al-Mousawi (born in 1959), who, while less of a full-time activist herself, lacks for nothing when it comes to the intensity and self-possession of her own resolve. See, in this context, her remarkable performance in a BBC interview on April 30, 2012, putting the latest developments in her husband’s hunger strike in the context of the country’s wider situation. As mentioned, the award of this year’s Nobel Peace Prize to the Al-Khawaja family would constitute the prize’s first acknowledgment of the epochal Arab Spring movement as such. Furthermore, the unprecedented award in this context to an entire family would be especially fitting, honoring the generational sweep of the struggle and in particular the bonds between fathers and daughters in a way that eschews and even upends the standard Islamic/patriarchal clichés. Bahrain’s struggle is particularly dramatic (the mass movement of majority civil society against an entrenched, minority and deeply repressive hereditary monarchy) and relatively underreported. Western coverage in particular has been somewhat muted by the fact that both Britain and the United States are deeply implicated in the formation (in the former case) and the sustaining (in the latter) of the regime in question. In addition, Saudi Arabia and the Gulf States are similarly allied with Bahrain’s Sunni royal family in their repression of the great mass of their subjects, who are Shiite. Furthermore, for all its seeming intractability, the situation in Bahrain is not entirely without hope. The regime is hardly monolithic in its hard line, there are reformist elements who could themselves be heartened, their own positions strengthened, by the award of the Peace Prize to a family of nonviolent oppositionist activists. In this context, the situation in Bahrain is not unlike that in Myanmar/Burma a few years back, and the introduction of a Nobel into the Bahraini environment might prove as salutary. 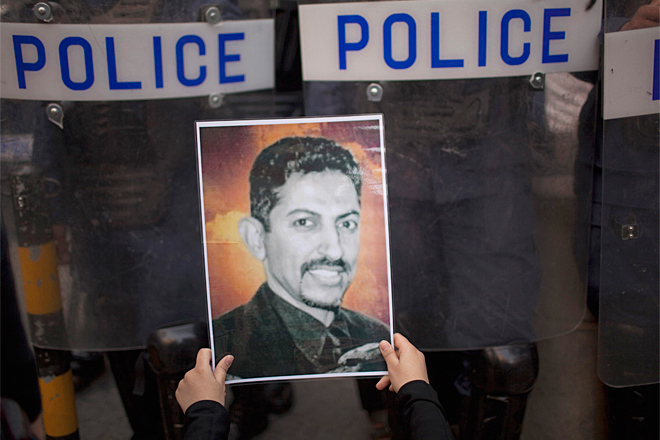 While it is true that, in response to regime provocations and in despair over the continuing virulence of regime repression (and the relative lack of interest being expressed by the rest of the world over this situation), the opposition movement in Bahrain has at times been becoming more violent, Abdulhadi al-Khawaja has remained resolute in his advocacy of nonviolence. More than a hundred days into his hunger strike, with death staring him in the face, he asked his daughter to convey an urgent message to his followers: “If I die in the next … hours, I ask the people to continue on the path of peaceful resistance. I don’t want anybody to be hurt in my name.” A Nobel Peace Prize could give further legitimacy to that position, fervently shared by the rest of his family, at a critical juncture in the country’s struggle.